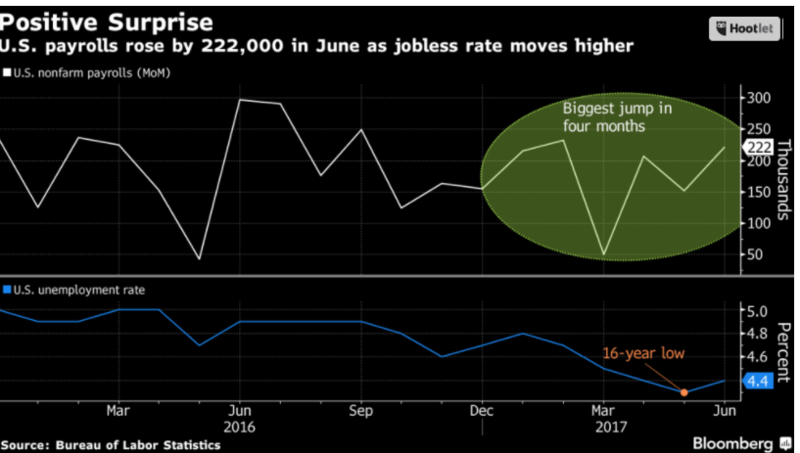 The June jobs data blew past expectations, all but insuring that the Bank of Canada will hike interest rates by a quarter point next week–the first rate hike in seven years. Market rates have already risen in expectation and the Royal Bank has boosted interest rates on its two-year, three-year and five-year fixed-term mortgage rates up by 20 basis points each. The Canadian economy has been performing well with 3.7% growth in GDP in the first quarter and the second quarter gain is now likely to be roughly 2-3/4%. The Bank of Canada has been signalling a rate hike for a few weeks, despite continued low inflation, as incoming economic data have been surprisingly strong. This has boosted the Canadian dollar, now trading at about 77.4 cents US even as oil prices have weakened to under $44.00 a barrel (WTI). Higher mortgage rates will come on the heels of a marked slowdown in the housing market in the Greater Toronto Area and surrounding region. According to data released this week by the Toronto Real Estate Board, June resales activity continued its abrupt slowdown, which began with the April 21 imposition of a foreign buyer’s tax in the Greater Golden Horseshoe. Over the same period, sellers have increased sharply as new listings and active listings have surged, putting downward pressure on average home prices. Year-over-year gains in house prices have more than halved from a 30% y/y gain in March to less than 15% most recently. The Ontario government actions to slow housing have clearly had a marked psychological impact as both buyers and sellers perceive that housing has peaked. Moreover, recent proposals by the bank regulator, to stress test mortgage applicants for non-insured loans (where downpayments are 20% or more) on the same basis as for insured loans will also dampen housing activity. Employment rose by 45,400 in June, mostly in part-time work. The jobless rate fell by 0.1 percentage point to 6.5% nationwide. Compared to twelve months earlier, there were 351,000 (1.9%) more people working, where most of the growth was in full-time employment. The total number of hours worked increased 1.4% over this period. 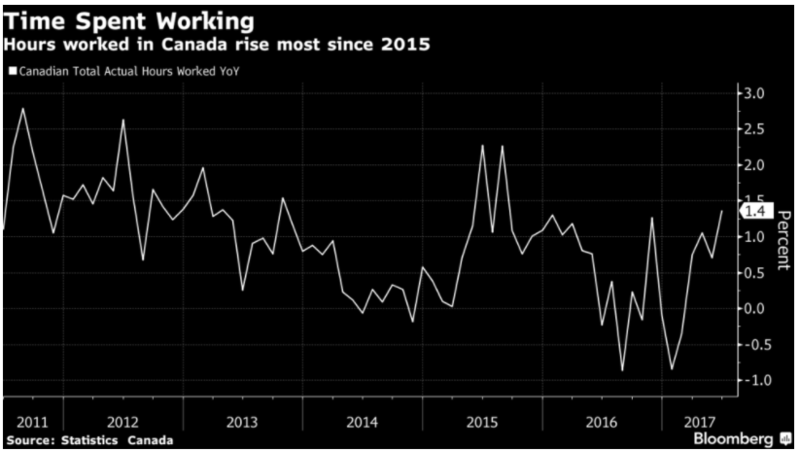 Job growth in Canada in the second quarter posted the fourth consecutive quarter of stronger-than-anticipated gains and the strongest quarterly growth since 2010. Job gains have accelerated this year from its 2016 pace. Average hourly wages of permanent employees rose 1.0% in June from a year earlier, matching the pace for May. For all workers, wages rose 1.3% over that period. The pace of wage gains, a closely watched indicator of the health of the labour market, had slowed to a record low in April, and the recent acceleration will reinforce speculation the time has come for higher interest rates. Quebec and British Columbia led the way in job gains. The Quebec unemployment rate held steady at a record-low 6.0%. 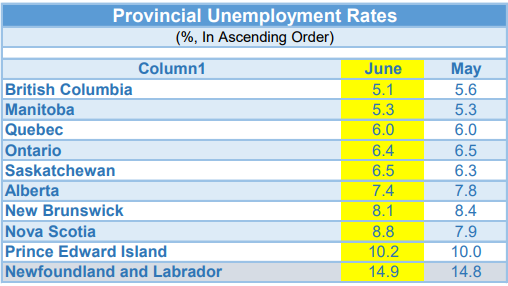 In BC, employment rose by 20,000 and the jobless rate declined 0.5 percentage points to 5.1%, the lowest provincial unemployment rate in Canada. In Ontario, there was little change in the number of people working, and the unemployment rate was also little changed at 6.4%. On a year-over-year basis, employment in the province grew by 75,000 (+1.1%). Employment in Ontario was virtually unchanged in the first half of 2017, following an upward trend in the second half of 2016. More people were employed in professional, scientific and technical services, as well as in agriculture. At the same time, employment declined in business, building and other support services. Payrolls increased by 222,000 in June in the US, stronger than expected, but the jobless rate increased to 4.4% from a 16-year low of 4.3% as the robust labour market pulled discouraged workers off the sidelines. The labour force participation rate–the share of working-age people in the labour force–which had fallen to record lows in the wake of the financial crisis and recession, has now increased to 62.8%, but it is still near its lowest level in more than 30 years. The U-6 measure of underemployment, which includes discouraged workers and those who are involuntarily working less than full-time, rose to 8.6% from 8.4%, the first increase since January. The report marks a relatively strong finish for the labour market in the second quarter that should support continued gains in consumer spending in coming months. Federal Reserve policy makers raised interest rates last month and reiterated plans to start reducing their balance sheet and increase borrowing costs once more this year. Wages showed declines in nondurable-goods manufacturing, professional and business services; small gains in retail, transportation and warehousing; overall wages in the US are rising at 2% three-month annualized pace. Inflation remains below the 2% Fed target, but Fed rate hikes at a measured pace will continue.